The tragus is a small cartilaginous structure and it is located on the anterior margin of the auditory canal. 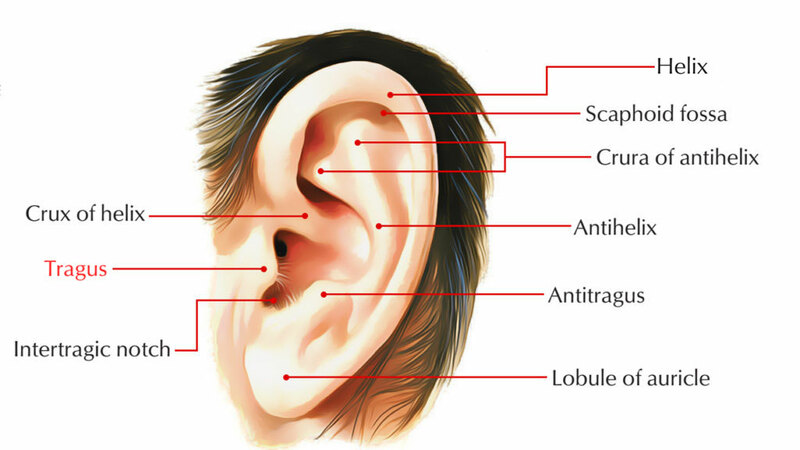 It is enclosed by special skin on its anterior and posterior parts and it is essential to the ear for its esthetic, anatomical, and functional aspects. It grants a backward slope guarding the opening of the auditory canal. The antitragus is eminence opposite the tragus and at the end of the antihelix. The intertragic incisure is the indent in the middle of the tragus and antitragus. Head of mandible – In front of lower part of the tragus. Preauricular point – In front of upper part of the tragus. The temporomandibular joint is located inferior to the zygomatic arch and just anterior towards the tragus of the ear.